Home » Continuous Improvement » Five Green Belt Projects Rock with a Combined Yearly Savings of $743,000! ing on the 6M’s (Man, Machine, Material, Method, Measurement, and Mother Nature). Participants are then required to identify a project at their work place and use the tools and techniques to make improvements in order to become certified. All five participants completed their projects for a total combined yearly savings of $743,000. 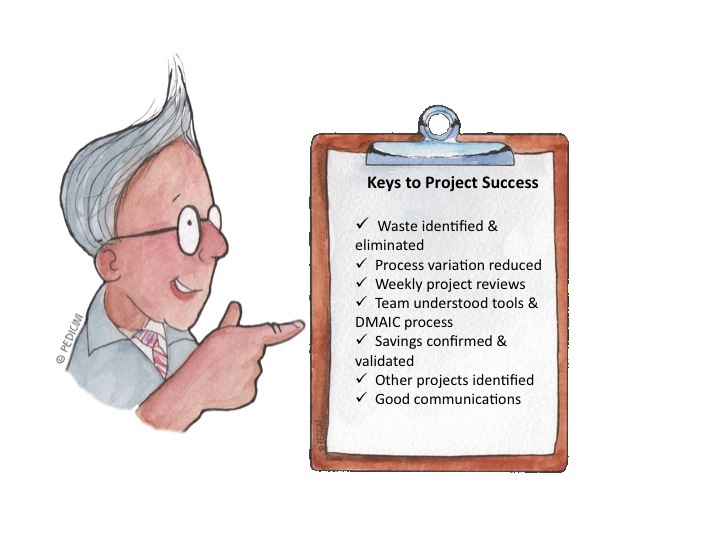 Concentrate on the DMAIC process. Conduct weekly project reviews with project sponsor to keep momentum going and eliminate roadblocks. Keep the tool kit basic and don’t overpower everyone with the statistics. Not everyone likes math. Concentrate on basic tools that turn data into useful information that will aid the team in resolving their issue. You can always add more advanced tools as teams mature and get comfortable with the process. Break down barriers between functional groups. Teams need to understand that there is nothing they can’t accomplish if they only work together to make it happen. Get early buy in from your accounting department concerning project savings. Everyone needs to be in agreement concerning the savings and provide the appropriate resources to resolve the issues. Be careful to ensure scope creep doesn’t come into play. Keep the initial project scope small. If the scope starts to expand make the resolution of those issues new projects. Communicate, Communicate, Communicate! Ensure everyone knows what’s going on and try to understand the concerns of the various stakeholders so they can be addressed. I’ve never been involved in or heard of a project where there was too much communication.